With rain expected over the next few days, residents should take precautions to protect their home and family from the possibility of flooding. 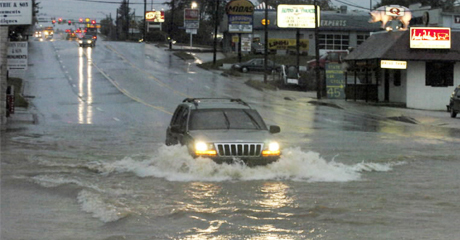 Eighteen to 24 inches of moving water can wash a SUV off of the road. In fact, according to the National Weather Service, more than half of all flood-related deaths are people driving through flooded roads. The nonprofit Federal Alliance for Safe Homes (FLASH) ® reminds residents to “Turn Around, Don’t Drown! ®” and offers the following safety tips to protect your home from costly flood damage. All it takes is a few inches of water to cause major damage to your home and its contents. Place important papers (birth/marriage certificates, passports, bank and insurance information) in a watertight container. Take photographs or videos to create an inventory of your personal possessions and keep the camera card handy in case of evacuation. When using sandbags be sure to fill one-half full, fold the top of sandbag down and rest bag on its folded top. Clear a path between buildings for debris flow and lay a plastic sheet in between the building and the sandbags to control the flow and prevent water from seeping into sliding glass doors. Flooded roads could have significant damage hidden by floodwaters. Never drive through floodwaters or on flooded roads. Take photographs of damage throughout the building and around the property. Assess stability of plaster and drywall. Bulging or swelling ceilings indicate damage. Press upward on drywall ceilings. If nail heads appear, drywall will need to be re-nailed but can be saved. To learn more about how much flooding can cost you, check out this cost of flooding tool provided by FloodSmart. For more home and family safety tips visit www.flash.org or www.protect-your-home.org. Federal Alliance for Safe Homes (FLASH)®, a 501(c)3 nonprofit organization, is the country’s leading consumer advocate for strengthening homes and safeguarding families from natural and manmade disasters. FLASH collaborates with more than 120 innovative and diverse partners that share its vision of making America a more disaster‐resilient nation including: BASF, Federal Emergency Management Agency, Florida Division of Emergency Management, The Home Depot®, International Code Council, Kohler® Generators, National Weather Service, Portland Cement Association, RenaissanceRe, Simpson Strong-Tie®, State Farm™, USAA® and WeatherPredict Consulting Inc. In 2008, FLASH opened the interactive weather experience StormStruck: A Tale of Two Homes® in Lake Buena Vista, FL. Learn more about FLASH and gain access to its free consumer resources by visiting www.flash.org or calling (877) 221- SAFE (7233). Also, get timely safety tips to ensure that you and your family are protected from natural and manmade disasters by subscribing to the FLASH blog – Protect Your Home in a FLASH. Why Does PA Have A Flooding?